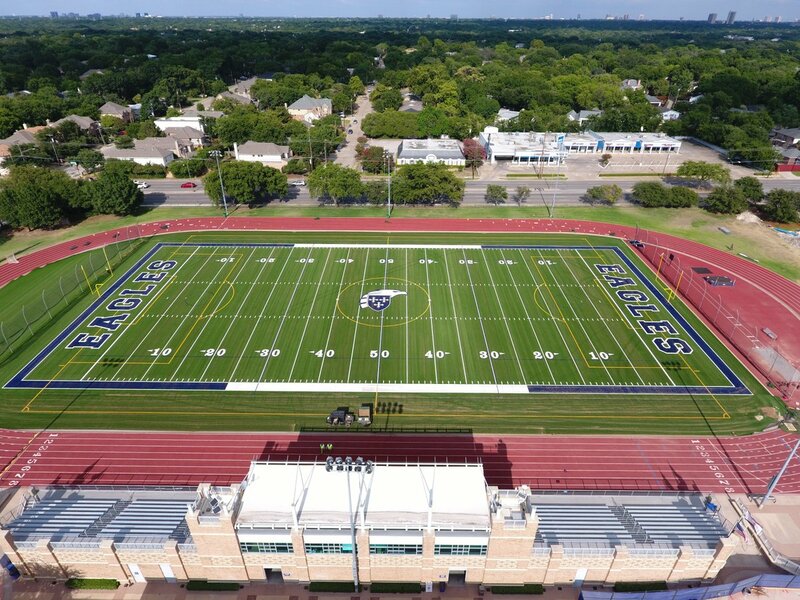 New Turf Installed at Jones Family Stadium Features AstroTurf's "Wonder-fiber"
ESD is pleased to report that installation of AstroTurf’s RootZone 3DSF Turf System featuring Trionic™ and SuperNatural is complete. The new turf is reportedly stronger and more resilient and could help reduce surface temperatures, an important feature in Texas! ESD is one of the first schools in the country to have Melos SuperNatural infill installed. RootZone 3DSF is a signature product that features slit film fibers for the ultimate in durability. The premium surface also contains AstroTurf’s patented RootZone technology, a thatched sub-layer of fibers that stabilize the infill and deliver enhanced safety and performance. The system features AstroTurf’s super-fiber, Trionic. Trionic is the new wonder-fiber of the synthetic turf industry that reinforces player-friendly polyethylene fibers with ultra-durable nylon polymers in a feat of chemical engineering never achieved before in the turf industry. The turf has a 60-ounce face weight, meaning it has very dense stitching. All of these factors combine to make a synthetic turf that is stronger, safer, better, and more resilient. The Episcopal School of Dallas project is using Melos SuperNatural EPDM Infill, which is blended EPDM rubber with 20 percent organic compound woven throughout the rubber materials. Melos brings legendary quality standards and an innovative approach to blend natural fibers into EPDM, creating additional cooling benefits. Advantages of this super-durable system include hemp which wicks water to help further reduce surface temperatures (which is crucial in the hot sun), no water required for the product integrity and the bulk density reduces the quantity needed. Also, to provide a level of environmental friendliness, renewable raw materials are included.